Enchanting forest animals come together to prepare a very special celebration for your child's birthday! This unique keepsake will surely be cherished for a lifetime.! 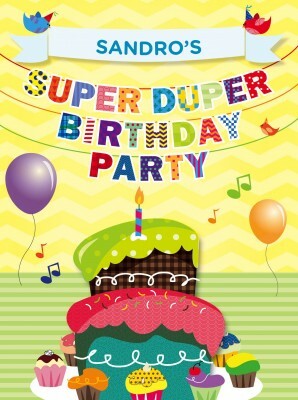 My Super Duper Birthday Party is an irresistibly charming personalized book beautifully illustrated by Janine Ngo and written by internationally published writer Maria Natalia Mercedes Diaz. Each 8 3/8" x 10 3/4" professionally bound hardcover book is personalized throughout the text and illustrations which include the child's name, age, birth date, and relatives and/or friends, making it a unique birthday gift perfect for your child. As an added personal touch, this book contains a printed dedication from the sender with the child's birth date. This 24 page storybook is a perfect birthday gift for both boys and girls ages 0-10.